As contamination and environmental degradation increase, there is a huge demand for new eco-friendly materials. Despite its use for thousands of years, cellulose and its derivatives have gained renewed interest as favourable alternatives to conventional plastics, due to their abundance and lower environmental impact. Here, we report the fabrication of photonic and plasmonic structures by moulding hydroxypropyl cellulose into submicrometric periodic lattices, using soft lithography. This is an alternative way to achieve structural colour in this material, which is usually obtained by exploiting its chiral nematic phase. Cellulose-based photonic crystals are biocompatible and can be dissolved in water or not depending on the derivative employed. 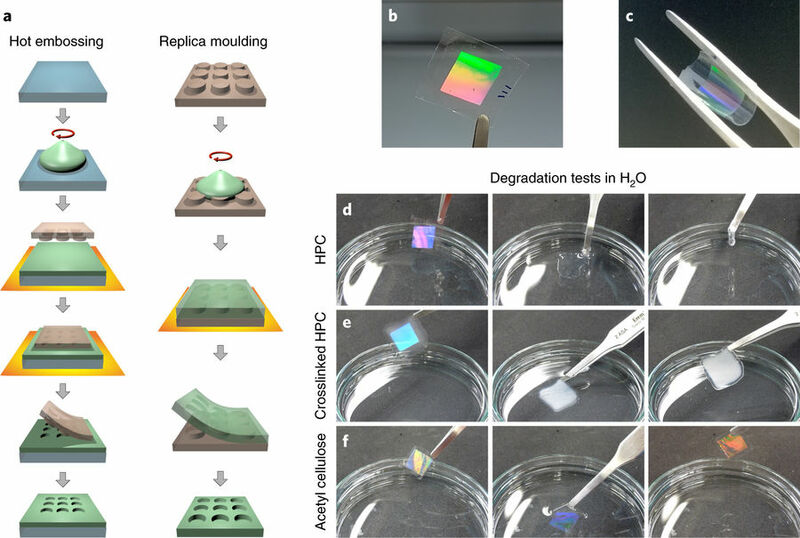 Patterned cellulose membranes exhibit tunable colours and may be used to boost the photoluminescence of a host organic dye. Furthermore, we show how metal coating these cellulose photonic architectures leads to plasmonic crystals with excellent optical properties acting as disposable surface-enhanced Raman spectroscopy substrates.